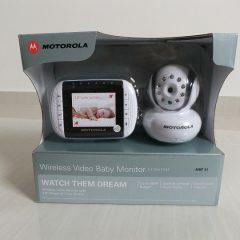 When it comes to feeding your baby, you only want the best for him or her. This is what we believe to be every parent's will and desire but let's face it, doing so is getting harder and harder in today's society. Just how many news have you seen so far about the existence of harmful ingredients in the food that we adults eat? Chemicals, preservatives, even antibiotics are found and what's worse, is the existence of fake food - honey that's not even honey but just a bunch of sweetener and chemicals put together. And surely you've heard of the milk scandal back in 2008? Now, you certainly do not want to be feeding your little one with all these toxics, at least not when it's within your control. Which is why more and more parents are leaning towards organic food nowadays, and that includes starting from as early as the infant formula that baby consumes. If you don't already know, 'organic' refers to the way agricultural products are grown and processed. Here in the U.S, when crops are termed 'organic', it means they must be grown without the use of synthetic pesticides, bioengineered genes (GMOs), petroleum-based fertilizers, and sewage sludge-based fertilizers. Likewise for livestock, they must have access to the outdoors and be given organic feed. 1. Fewer pesticides. Chemicals like herbicides and insecticides are not used which mean there is no such residue remaining on/in the food, in turn, babies are not exposed to these harmful chemicals at their vulnerable stage where everything else is still developing (immune, hormonal and nervous system). 2. No antibiotics, growth hormones, or fed animal byproducts. These are banned, instead, organically-raised animals are given more space to roam around and have access to the outdoors to keep them healthy. With no animal byproducts fed to livestock, the risk of mad cow disease (BSE) is also decreased and there is no need to worry about the creation of antibiotic-resistant strains of bacteria. 3. Fresher. No doubt about this one, with no preservatives used, the food produced is definitely fresher which means they should be consumed as soon as possible. 4. GMO free. Likewise, Genetically Modified Organisms or genetically engineered food (DNA that has been altered in ways that cannot occur in nature or in traditional crossbreeding, most commonly in order to be resistant to pesticides or produce an insecticide) is not present in organic food. 5. Richer in certain nutrients. Studies have found that levels of certain nutrients, including omega-3 fatty acids and antioxidants, were up to 50 percent higher in organic meat and milk than in conventionally raised versions. By all means, we're not saying that only organic food is healthy - standard food is packed with the same nutrients and vitamins too (you just have to find the safe ones!) and they are comparatively much more cheaper than organic for most households to afford. Nonetheless, there are certain benefits that undeniably only organic food possess (e.g. people with allergies to foods, chemicals, or preservatives often find their symptoms lessen or go away when they eat only organic foods), which is why organic is the way to go for so many parents for their baby. 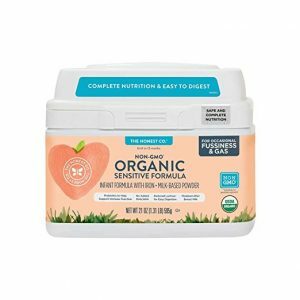 Below are our reviews on some of the best organic baby formula available in the market, including our answers and recommendations to some of the most asked questions: what is the best formula to supplement breastfeeding, the best infant formula for breastfed babies and generally, what is the best infant formula for gassy or colic babies. The Baby's Only Organic LactoRelief with DHA & ARA Toddler Formula is the best formula for gassy babies, an organic one at that! Non-GMO and gluten free, this is the best formula for colic or reflux suffering babies. While it is still a milk-based formula, the lactose or milk sugar has been reduced using a special enzyme process so if your little one is lactose intolerant, this is a good alternative if you wish to avoid soy protein in baby's diet. As far as we know, this is the only organic formula that caters to sensitive stomachs. One thing we love about it is that it contains no hexane processed DHA, in fact, this natures best organic formula (nature best is the manufacturer company) is the only formula that does not use the hexane extraction process. Instead, high levels of essential fatty acids that baby's body will naturally convert into DHA (omega 3) and ARA (omega 6) are present. Further, it uses naturally-sourced rather than petroleum-based vitamins, and uses brown rice syrup instead of corn syrup solids. 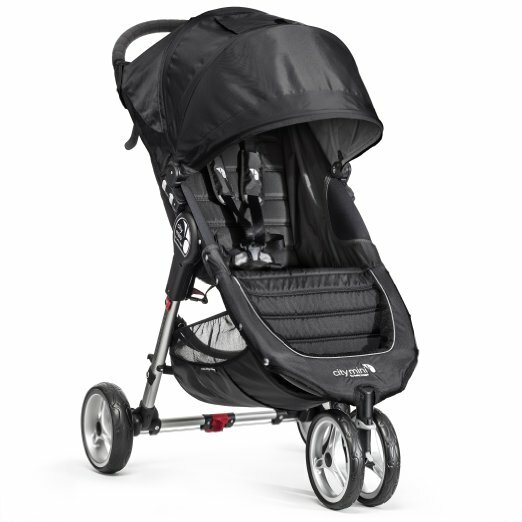 Now, we know what you're thinking - toddler formula? While there is no doubt it is one of the best organic toddler formula, it is suitable for newborns too (though we recommend always checking with your paediatrician first, as with anything else concerning baby) as the manufacturer has explained that the reason of naming it toddler formula is because breasfeeding is recommended for babies under 1 year old first. 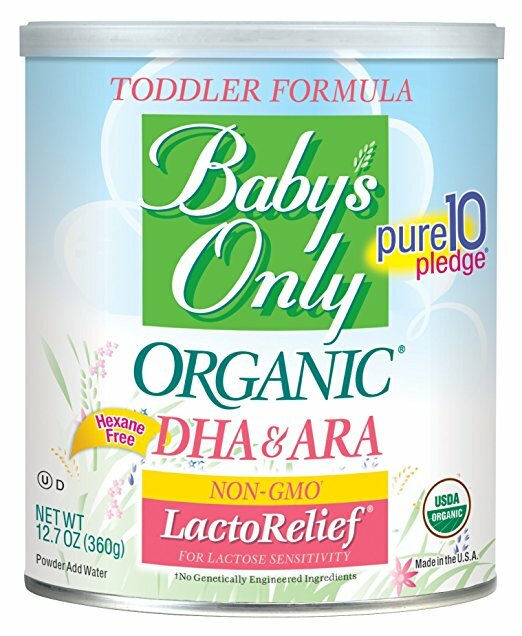 If you're dealing with food sensitivities or feeding difficulties, we highly recommend the Baby's Only Organic LactoRelief with DHA & ARA Toddler Formula, the best formula for babies with gassy/colic problems. Psst, it is rated as one of the best tasting baby formula too for its kind! 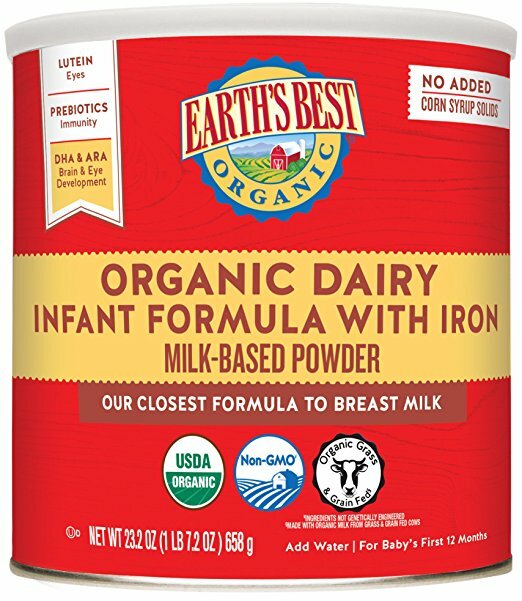 Being the first and original organic infant formula to be widely distributed in the market, we're sure you have had heard of the Earth's Best Organic Baby Formula at some point in your life, especially when there are so many Earth's Best organic formula reviews out there. 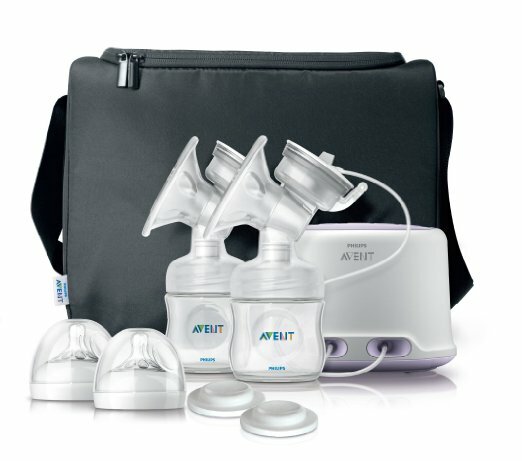 This is another best baby formula for breastfed babies because it is an all lactose milk-based powder formulation that mimic closely the natural breast milk. Other nutrients include Omega-3 DHA and Omega-6 ARA fatty acids, carbohydrates, vitamins, minerals and special nutrients found in breast milk (that had been clinically shown to be critical to baby's mental and visual development) with no added corn syrup solids. Moms across the world have also raved about how Earth's Best Organic Infant Formula is the best formula for supplementing breast milk as it is so easy to digest for their baby. Non-GMO and Kosher, you can be assured there is no prohibited synthetic pesticides and fertilizers in its formula. 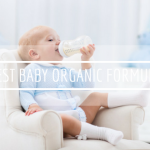 Overall, there is no doubt the Earth's Best Organic Formula is one of the best baby formula that is nutritionally complete for baby's first twelve months, with the added benefit of being organic. There is another lactose-reduced version that is highly popular for the sensitive tummies, and for those completely lactose intolerant ones, the brand has a non-GMO soy-based alternative too. If you're looking for the best organic formula for breastfed babies to wean your little one off breastfeeding, your best bet will be the Plum Organics Grow Well Organic Infant Formula. Modeled after breast milk which has lactose as its most abundant carbohydrate source, this infant formula uses cow's milk lactose only as its carbohydrate source. Unlike many others which use a combination of lactose and corn-derived sugards like corn or glucose syrup solids and/or maltodextrin, this one here uses just organic lactose and nothing else. It does include nonfat milk, oils (palm, coconut, soy, etc), whey protein, and a ton of vitamins, minerals, amino acids, omegas, and antioxidants. Yes, this one here contains DHA (Omega-3) and ARA (Omega-6) that promote brain and eye development without the need for baby's body to do the conversion from fatty acids. As one of the best organic formula for newborns, the milk found in Plum Organics comes from cows that are fed a diet of organic grain and hay grown without synthetic pesticides or fertilizers, and are never treated with rBST (no added growth hormones or antibiotics). Labelled with the USDA Certified Organic, it also means there is no genetically engineered or modified ingredients included, and is kosher dairy and gluten free. 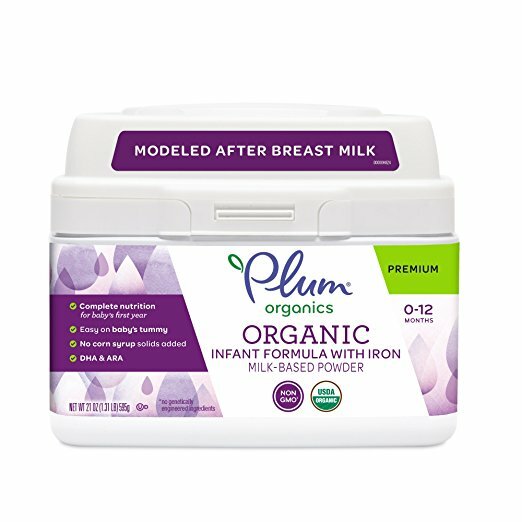 Not only is the Plum Organics Grow Well Organic Infant Formula one of the best formula for breastfed babies, it is also the best formula for supplementing if you have insufficient breastmilk supply given how closely it resembles the breastmilk so that your little one wouldn't feel much difference and discomfort making the transition. Nonetheless, we do have to say that it contains palm oil as an ingredient (also the reason we rate it second to the above) which has been linked to decreased bone density in some reports. Nevertheless, we cannot deny that it is definitely one of the best organic formula that is well tolerated by many. Another best formula for breastfed babies organic is the Happy Baby Organic Infant Formula Milk Based Powder if you plan to use formula since birth, unless if your baby is premature in which case we do not recommend this because preemies may have immune problems, and powdered infant formulas are not sterile hence are unfit for them. 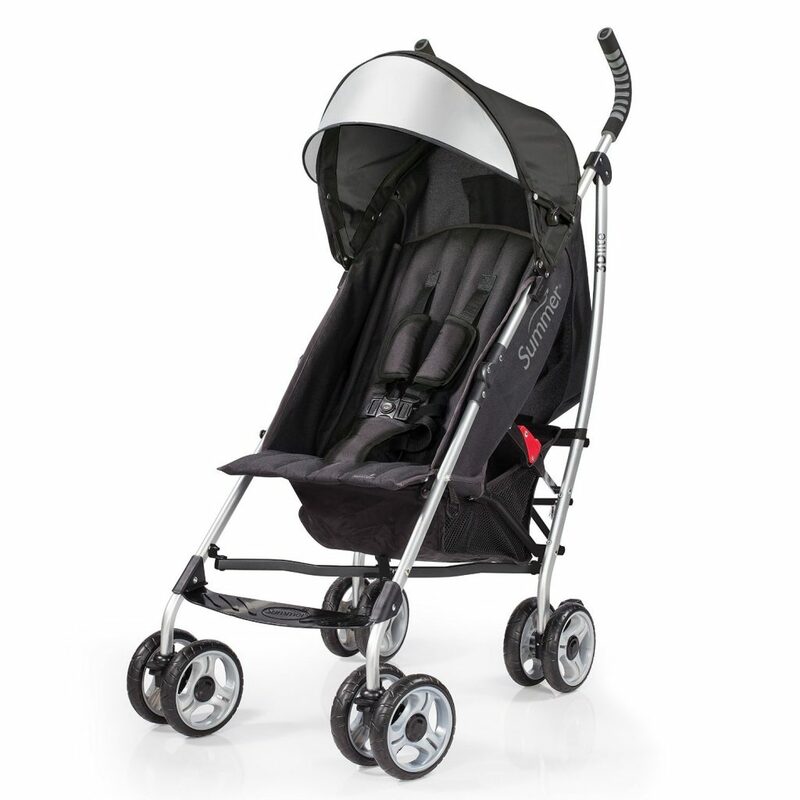 In any case, do seek your baby's doctor advice beforehand to be safe. Nonetheless, this Stage 1 organic infant formula is one of the best organic baby formula to supplement breastfeeding because of how closely it resembles the mother's breast milk's unique composition. Made with organic lactose and dual prebiotics, it is 100% nutritionally complete with all the essential nutrients including calcium, vitamin D, iron, DHA, ARA, folic acid and choline. As you would be rather familiar by now if you've read our reviews above, lactose is the main carbohydrate found in breast milk. Organic lactose that comes from cows raised on organic farms is the number 1 ingredient in this formula and there is no synthetic sweeteners like corn or glucose syrup solids added in it. Which is why it may not taste as sweet as breastmilk, but otherwise, it is close enough in terms of taste according to our testers. What we like about Happy Baby Organic is how each ingredient is premium-sourced, for example, the DHA & ARA (so vital for baby's brain and eye development) components are sourced from non-GMO algae while proteins, an essential building block for strong bones, muscles and organs, come from nonfat milk including whey and casein (ingredients naturally found in breast milk). Prebiotics are the third largest ingredient in this formula (because it is the third largest solid component in breast milk) and its mix of GOS & FOS) is 4 times more than any other organic infant formula distributed here in the U.S. 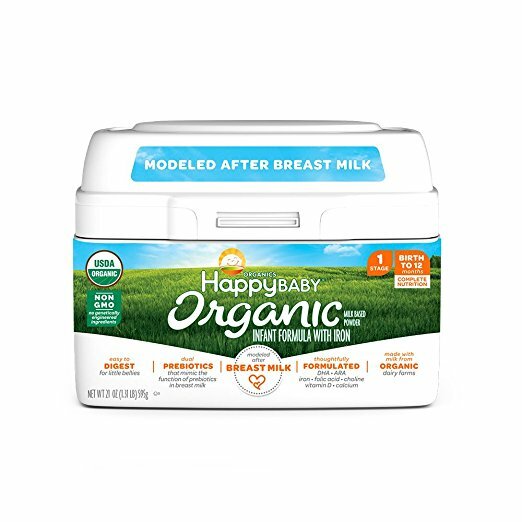 So really, there's nothing we can fault about the composition of the Happy Baby Organic Infant Formula Milk Based Powder - it is among the best organic baby formula up there together with earth' best infant formula and Baby's Only. One thing though, it does contain the controversial palm oil like Plum Organics and is slightly more expensive than the rest. Nonetheless, the price may be justified by its use of BPA-free packaging, in addition to being kosher, non-GMO and gluten free. It is still one of the best organic formula to supplement breastfeeding, in our opinion. 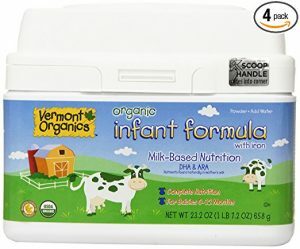 Vermont Organics Milk-Based Organic Infant Formula is another best baby formula for newborns that is USDA certified organic and has all the vitamins, minerals and nutrients required for your baby's first year. As with all organic formulas, it does not contain antibiotics, genetically engineered ingredients, added growth hormones and you can be sure there is no harmful pesticides because the milk that is used comes from cows that are fed certified organic grain and hay that are grown without synthetic pesticides or fertilizers. Why do we rate it number 5 then, you may ask? Well, its DHA and ARA are sourced from algae using the hexane extraction process which to be honest, is something you cannot avoid unless you go with Baby's Only, the only brand that does not use this method. 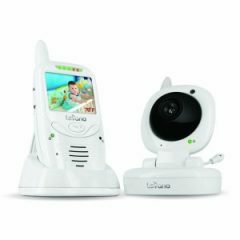 Aside from that, there has been reviews from parents who say their kid got constipated from it, although this really is a case that varies from child to child as there are some who simply cannot live without it. 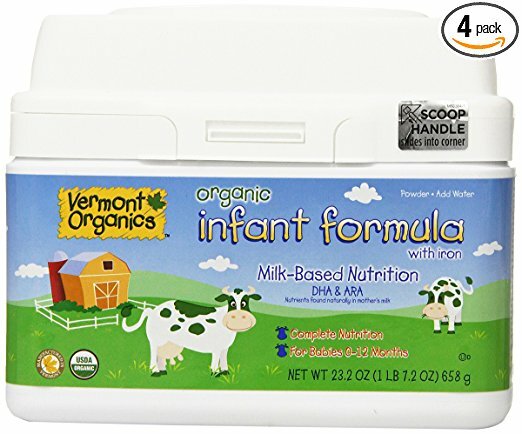 Nonetheless, one good thing about the Vermont Organics Milk-Based Organic Infant Formula is that it is more affordable than most other organic formulas, such as Baby's Only and Earth's Best (the two main players in this field) at less than $1 per ounce. We do have to let you know that it contains soy ingredients and is not kosher or gluten free though, so if this is a concern, we recommend going for other brands in our organic infant formula reviews. Last but not least is The Honest Co. Organic Non-GMO Sensitive Infant Formula that we want to talk about. This is the best formula for colic babies as vouched by many parents who say their kids do not suffer from upset stomach anymore after taking it. However, as mentioned above, kids vary and there are some that get constipated after consumption. Nonetheless, this is another organic infant formula option to go for (aside from Baby's Only) if you have a sensitive baby because its lactose level is reduced by 74% for easy digestion. The biggest and notable difference of The Honest Co. is that it is made without DHA/ARA. Yes, you've read that correctly - there is no DHA and ARA in its formulation. This is because the normal extraction procedure of DHA does not meet the company's standards, namely, the hexane extraction process. Instead, DHA is provided in supplement form - a non-chemically extracted, pure premium fish oil - to provide baby the DHA s/he needs. Nevertheless, it is packed with every other essential nutrient that baby needs - iron, vitamin D, calcium, choline, folic acid as well as prebiotics to help support the immune function - minus the GMOs, the antibiotics, hormones, carrageenan, gluten, added sucrose and corn syrup solids. 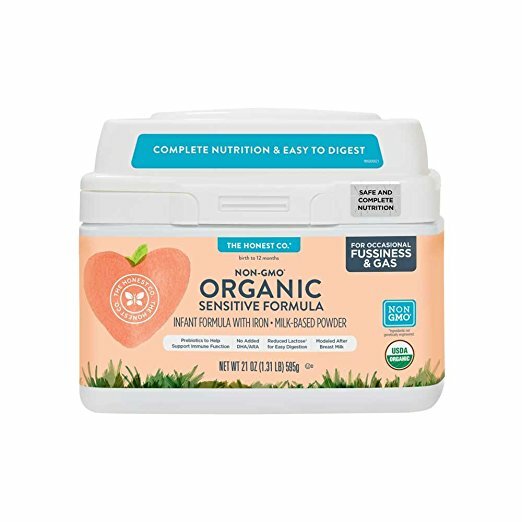 If you're fine with the lack of DHA (instead to supplement it with the company's fish oil drops), The Honest Co. Organic Non-GMO Sensitive Infant Formula will be one best infant formula (organic) to supplement breastfeeding because it is carefully balanced and modeled after breast milk. Best of all, its high quality ingredients are truly sourced from trusted organic farms, anything that does not fit within the company's rigorous standards, will be excluded. And it mixes so easily so clumps do not form, easy to digest for the little tummies! 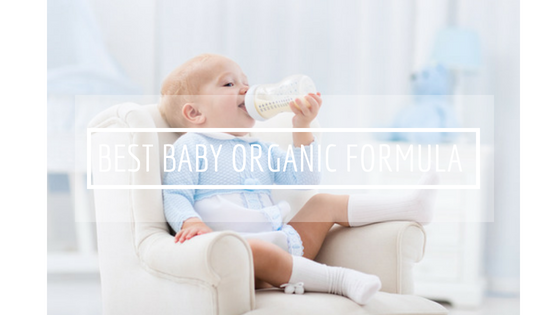 No surprises there, the Baby's Only Organic Dairy Formula is definitely one best rated organic baby formula for toddlers beyond the newborn and first year of age. We wouldn't describe the content and formulation of this infant formula too much here because it is similar to the LactoRelief version described above, the difference being this one here contains the full dosage of lactose as opposed to the LactoRelief version. This is why the Dairy version is more suitable for toddlers, one that we would recommend because toddlers' tummies are stronger by this age, as opposed to when they were a newborn more vulnerable and susceptible to sensitivity. This is because Baby's Only formula is casein dominant (aside from whey as its protein source), which is one common cause of constipation in babies because casein is hard to digest. This wouldn't be a problem for toddlers as they are able to digest better with their stronger tummies. Otherwise, the formulation is the same as the LactoRelief version - gluten free, no growth hormone, steroids or antibiotics, no corn syrup solids, no palm oil and certainly no GMO ingredients. Likewise, it does not contain any hexane-extracted DHA and ARA, rather, higher levels of essential fatty acids are included for your baby's body to convert to DHA and ARA. 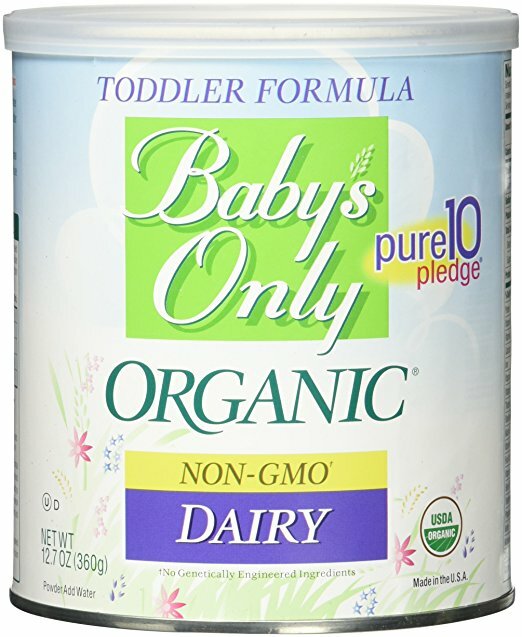 Coming from the best baby formula brand known for its high organic quality, Baby's Only Organic Dairy Formula is the best natural organic baby formula for toddlers, including those that have gluten or corn allergies. And with a price of under $1 per ounce, it is no wonder parents across the world love it so much! 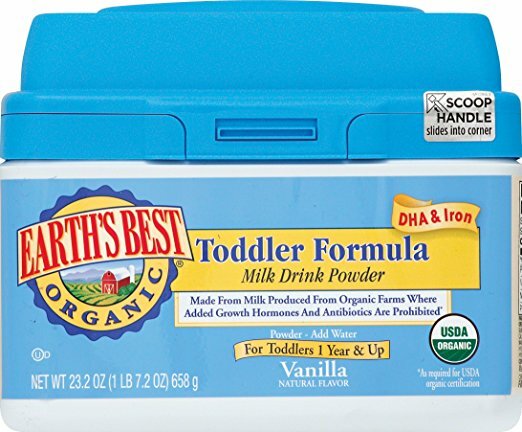 Next in line is the Earth's Best Organic Toddler Formula, an organic milk-based powder toddler formula for ages one year and up. The reason we rate this second to Baby's Only is the same as its infant version - it contains DHA & ARA that are sourced using the hexane extraction process. 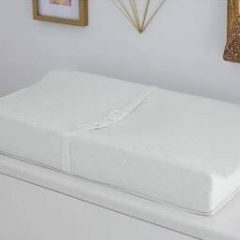 While this is a common practice not prohibited in any way here in the U.S, it is still a deterrence to some parents who'd prefer to stay away from all sorts of chemical. 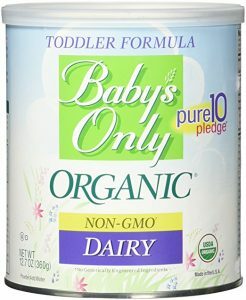 If this is not a problem for you, then we'd say this toddler formula is one of the best organic non GMO baby formula for your toddler. Nutritionally complete with all of earth's best organic formula ingredients such as high quality protein, carbohydrates, vitamins, minerals and essential fatty acids, it also contains iron that meets all FDA requirements. Its milk is produced from organic farms where added growth hormones, synthetic pesticides and fertilizers are prohibited. 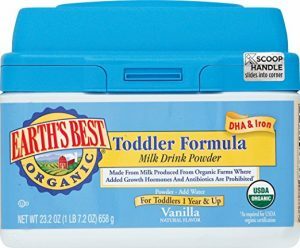 Overall, the Earth's Best Organic Toddler Formula is an amazing toddler formula to consider if for some reason, Baby's Only or other toddler formula doesn't suit your little one's tummy. And oh, it is Kosher too, so that's a bonus point to those concerned about this. 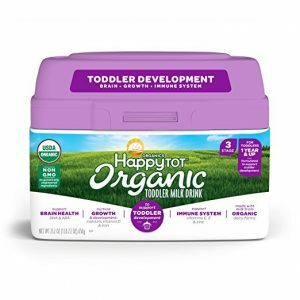 Happy Tot Organic Toddler Milk is the last on our list of best baby formula organic for toddlers. This toddler milk is catered to children aged 12-24 months and is formulated to support your child during this vital time in his or her life with organic non-GMO ingredients and specific nutrition for continued development. Apart from DHA and ARA that support your toddler's brain and eyesight development, it also contains 35% daily value of calcium and 20% daily value of iron. Nevertheless, we do have to say that its taste is not quite on the same level as Earth's Best and Baby's Only, however, this really does depend on your toddler's preference. We know of some parents who say their child simply rejects the above two toddler formula and will only drink Happy Tot Organic Toddler Milk, so really, it's a case of what your child prefers in the end. The good thing is, this one is slightly cheaper than the other two at around 80cents per ounce only.